Sony cuts back the price tag -- and compatibility with PS2 games -- in an effort to kick-start PlayStation 3 sales. In a pair of announcements across two continents in the past few days, Sony has revealed its plan to get the PlayStation 3 back into the swing of business: Pare it way down. The company will launch new versions of the unit that pack smaller hard drives and fewer USB ports than the original flavor, and that, most important, are no longer backward-compatible with PS2 games. 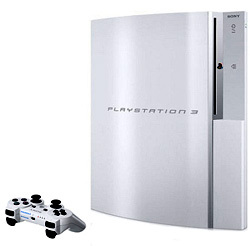 The new PS3 carries a 40 GB drive, compared with 60 GB on the full version. It has two USB ports instead of four. In Europe, where it comes in any color as long as it's black, it'll sell for 399 euros, or about $560, starting Oct. 10. In Japan, where the model is also available in white, you can pick one up for 39,980 yen, or $342. Japanese gamers might also want to get ahold of Sony's new DualShock 3 controller, which adds a tactile rumble to PS3 games. That sells for 5,500 yen, or $47. Hey, what about here in the U.S.? While it seems sensible for Sony to put out a North American version of the low-end PS3, it hasn't made any official changes to the lineup. If you're on this side of the pond and want a PS3 you'll have to choose between the 60 GB version -- which features full PS2 backward compatibility -- for $499, though Sony has stopped making these and they may be scarce on the shelf; and the $599 80 GB model, which handles PS2 games through an allegedly slower software emulation engine, and of which there's ample supply. Happy holidays!